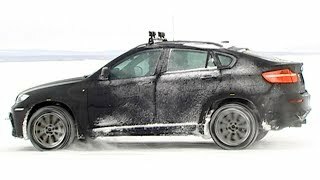 BMW has launched a new variant of the BMW X6 M in a limited edition of 100 cars called the X6 M Design Edition. It boasts particularly sporty and visually striking elements both inside and out. The front end is defined by its black BMW kidney grille and black exterior mirror caps. Aerodynamic fine-tuning is underlined by the carbon M Performance front splitter, rear spoiler and the black rear diffuser. The X6 M Design Edition models drive on 21-inch M Performance light-alloy wheels in double-spoke design. The interior comes nicely equipped with Merino leather seats, a Black/Mugello Red instrument panel with Mugello Red contrast stitching. Other highlights include trim in Piano Black, a model-specific "1/100" badge and other standard equipments. 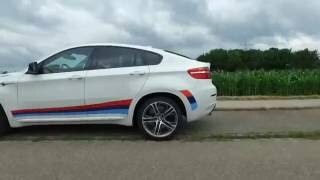 The 2014 BMW X6 M Design Edition is powered by a TwinPower Turbo 4.4-liter V8 engine developing 408 kW (555 hp) and peak torque of 680 Nm (502 lb-ft). It is connected to a six-speed M Sport automatic transmission and an all-wheel drive system. It accelerates from 0-100 km/h in 4.7 seconds and hits a limited top speed of 250 km/h (155 mph).